A intriguing piece of public art, Glenn Kaino’s Arch, will soon be on display inside Pittsburgh International Airport, most likely in the Landside Terminal. The work is a transformer/robot made up of pieces that look like Pittsburgh’s bridges and was originally located in Downtown Pittsburgh’s Cultural District, evidently as a temporary installation celebrating the city’s 250th anniversary. Now the work will be moved inside. 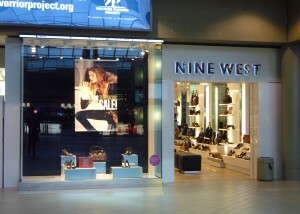 Arches should be happy at PIT airport, which already has a good deal of artwork, including an Andy Warhol Museum exhibit, and – last time I checked – an Alexander Calder mobile titled Pittsburgh, a model of a T Rex that is about 15 feet high and 30 feet long and a shrine to Mister Rogers. Despite the van driver’s assurance that we’d get stuck in rush hour traffic, I arrived at Pittsburgh International Airport yesterday with plenty of time to poke around before my flight. Good thing. Because in addition to the free internet access, there really are plenty of reasons to appreciate spending time at this airport. The mobile by Alexander Calder in the center core. This is a great art treasure to have at the airport. 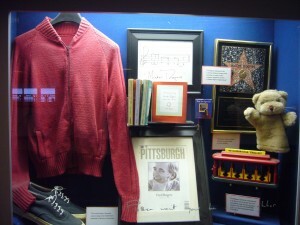 The shrine to Mr. Rogers, who filmed his long-running running TV show in Pittsburgh. And, just across the way, a wall covered in Andy Warhol self-portrait wallpaper, along with several pieces of his artwork.